Thought I'd share the outcome of my deliberations about the weighted surcingle training item I blogged about recently. As I got closer to a decision, I decided to contact one of the farms that is listed as using the product. Via email I inquired about their experience and asked if they had a spare to rent or sell. The email response came back the same day. There was a slight mixed message, however. The trainer did not want to sell or rent me the surcingle, saying he might need it at some point. He also could not/would not provide detail on why he held a dim view of the surcingle. He did not say that the product does not do what it claims to do. I was curious about why it was not used, and pressed him a bit for details. Was the surcingle was just too much trouble? Were there issues with fit? Did horses react badly? My questions went unanswered. I appreciated the trainer's time, and he clearly wanted to help me. But was his assessment 100% fair and accurate? I'm not sure. Knowledgable, experienced trainers often have their own preferred methods and strong opinions about what works. I wish he could have backed up his opinion with some examples. My thoughts after this? Well, the conversation gave me pause, and then I went online to review the product info. I had never been to the order page and wanted to see if shipping was included (for an item this heavy it could be significant). I noticed that a) the price increased to $425 and b) shipping of this hefty item is now included in the purchase price. So you won't be too surprised to know that there is no Astride in my future. I'll be doing it the old fashioned way. This isn't a thumbs down review, however. After reading what I've read about it, I feel that it could be very useful at large farms with a lot of youngsters. If I backed more than 1-2 horses a year I might make a different decision. It's just not a good fit with my situation.. I purchased the surcingle to use with young horses, to allow them to gradually build up muscle and balance and get used to the feel of a saddle before actually asking them to carry a person's weight. The surcingle is very sturdy, comes with a thick fleece pad and will probably last as long as I do! Just wanted to let you know that I had a positive experience with Krista and with the Astride, and am happy with the chance to save a little of the $$ stuff. THANKS Vicki! I saw the option for buying the surcingle w/o weights but wasn't sure how I'd duplicate the weights. Your suggestion is a good one. Can you share how you used it, and what your experiences were? i was wondering if it would fit over a saddle? i'm a bit hesitant to put it right on the back where the weight will not be distributed but concentrate just under the surcingle. i was thinking a saddle might help distribute the pressure and simulate riding better, but my horses are enormous (like 56" girth) and i doubt it would fit like that. what do you think? I wonder if there is a way you could fashion weights to a saddle instead of a surcingle? Huh! H-m-m-m, never thought much about this. Interesting concept, but I'd think there might be some other way to get the same results? I've only started three horses in my career, and in each case I lunged them in saddles first and then started riding only about 10-15 minutes at a time for a week or so and then gradually built up time. I usually don't add weight prior to mounting, but I have had a need now and then. I used what was called when I was a kid "Mr. Blue Jeans", a pair of jeans, legs and waist tied shut securely and filled with sand. Fits a saddle nicely, too. I know they have sand for weights, which is pretty quite and heavy per amount of space being used. I bet that would distribute the weight better, too! I used this method myself when adjusting my filly to weight. I used tubes of sand that were tied to the surcingle. Each day I would add more sand to the tube on top and then to the two that were on the sides. I am almost certain the farm you contacted was Rolling Oaks Farm. The prior trainer, Kelly, used the Astride on numerous horses and insisted on taking it with her to her new job when she relocated. The farm manager/owner however wanted to keep it, I ended up giving them one at a low price to resolve the dispute, since Kelly had been so supportive of the product, and even appeared in our video. 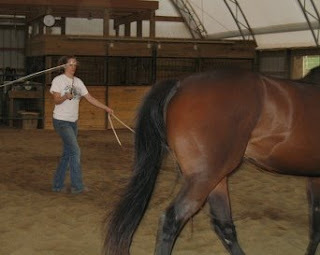 She has since moved on to a job in the equine health industry. Meanwhile Rolling Oaks farm has hired a new trainer, and I doubt he has ever used it. Although I am not surprised that the managers of the farm are not ready to part with it. The Astride is not inexpensive, because it just can't be. It is designed to safely carry a large amount of weight, hold up under vigorous use, fits almost any size of horse, is easy to put on and off, is padded with wool flocked panels, lined and made from leather, comes with a two year warranty, and the ( 8lb.) weight bags now retail for up to $36 PER, please price them yourself, you will see after adding all of the components that the unit is not overpriced, in fact our margins are very, very low, this is why you don't see it in the Dover catalog or in your local tack shop. This was designed as an easy way to introduce weight- sand has no comparison if you need to have the horse carry a significant amount of weight, and the design of it allows for safe, stable weight carrying. I agree the cost may prohibit the owner/trainer of a couple of horses from buying one, but certainly a barn could have one as a piece of equipment to loan out when necessary. I/we have decided to focus our effort mostly to the TB/rehab industry, to condition and hopefully help eliminate many of the breakdowns, and rehabilitate horses with injuries. And of course people prepping expensive horses for yearling sales rehabbing and conditioning athletes likely have more of a need for my product. I do wish there was a way to make it more accessable if price is the issue, but currently there is not. And I do hope those using sand bags and dummy riders and such (talk about gadjets!) will use these with care, in my opinion they would be much better off hiring someone for a short time to ride their young horses rather than risk potential injury from a rigged up device. Although as one of your members commented, we do now offer self fill bags which has lowered the cost a bit. Hi everyone - I have one of these surcingles and I personally love it. Picked it up used (at a steal of a price too I might add) for my gelding who has EPM. It was the lite version but I can easily fashion more weights to add for him. I personally always use it with even weight on either side (so I start with it empty and then use it with 8# on each side pocket). The surcingle itself is well padded and comes with the Wilkers saddle pad for under it (I also use another saddle pad - specifically the spur rub pad from SmartPak with the surcingle). I do not use it over a saddle as that is not necessary and have found it to be well received by the horses I use it on. Personally I will always recommend this product to anyone for backing a horse or rehabbing an injured horse. Even had I not stumbled upon the used Astride like I did I would have no issue purchasing one new even for one horse. It has been worth it's weight in gold for what it has and will do for my gelding as he rehabs from EPM. I am happy you are pleased with the surcingle, and I appreciate your support.